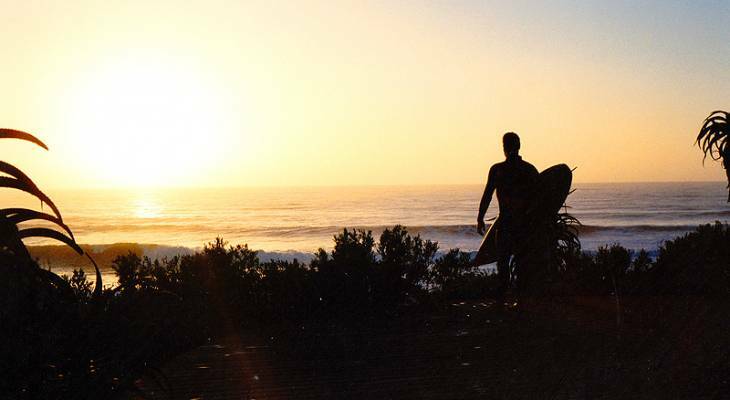 Jeffreys Bay is considered the surfing jewel of the Eastern Cape. Rated among the ten best surfing spots in the world, Jeffreys Bay, or 'J-Bay' as it's known to the locals, hosts the Billabong Surfing Festival every July, which attracts top surfers from around the world to ride the infamous Supertubes. Jeffreys Bay is a paradise of classic reefs, sunshine and dolphins, and visitors who find it hard to leave such an idyllic spot have turned J Bay into a year-round fun place to be, creating a thriving local craft industry besides the surf shops on just about every corner. Jeffreys Bay is a small bustling town, making the beachfront accommodation, internet cafes, shops and of course surf shops all within easy walking distance. A good selection of coffee shops, fast food take aways and restaurants cater for every culinary taste - make sure you sample the treats from the Jeffreys Bay bistro - Ozone Cafe, sure to "upsize your taste-buds and decadence levels". Jeffreys Bay, Eastern Cape (JBay) invites you to soak up the sunshine, savour the year-round warm water, enjoy the relaxed atmosphere of this E Cape surfing town and have a wonderful stay. Potter's Place - Indulge your taste-buds, take a pottery lesson, browse the gift shop, or watch a seasonal live show. J Bay Happy Hippo Play Farm - let the kids feed the farm animals and play. Fountains Mall - shop till you drop while the kids are occupied at Funky Frogs Play Centre. Jeffreys Bay Surf Museum - see why J-Bay has been one of the top surfing spots in the world for the last 50 years. J Bay Impala Ranch MTB Trails - a fun, fast paced 18km loop through forests and valleys. Jeffreys Bay Golf Club - 9 hole course situated 70m above sea level with a beautiful view over the ocean. Dolphin Beach Entertainment Centre - famous for its 18 hole Putt Putt Course and heated waterslide. Kabeljous Nature Reserve - hike through dune thickets, forests, bushveld and wetlands. Jeffreys Bay overview. Jeffreys Bay Accommodation and Information.